It means Garbage Collection throughput is 96.67% (i.e. 100–3.33). Object creation rate is the average amount of objects created by your application. Say suppose your application was 100mb/sec. And recently it starts to create 150mb/sec without any increase in the traffic volume — then it’s an indication of some problem brewing in the application. 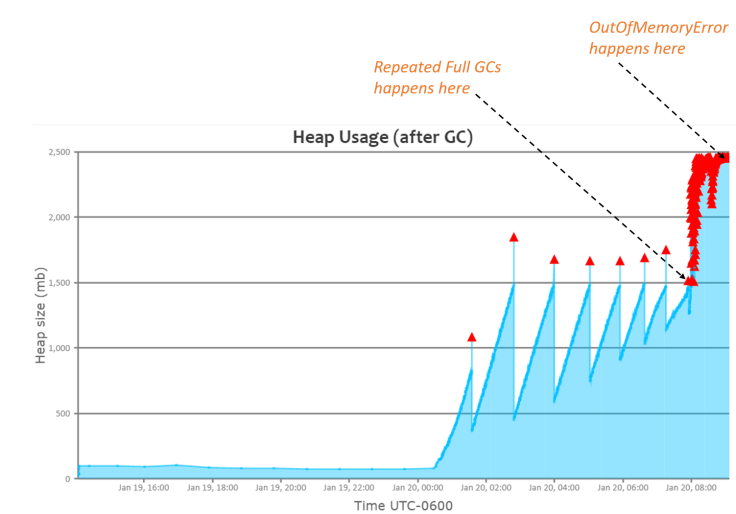 This additional object creation rate has potential to trigger more GC activity, increase CPU consumption & degrade response time. 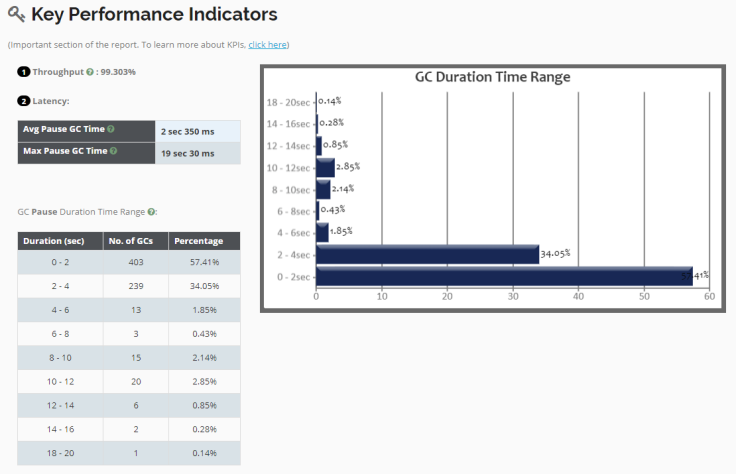 You can use this same metric in your CI/CD pipeline as well to measure the quality of code commit. Say in your previous code commit your application was creating 50mb/sec. Starting from recent code commit, say your application starts to create 75mb/sec for the same of amount traffic volume — then it’s an indication of some inefficient code commit to your repository. (2). Once garbage collection logs are generated you can either manually the GC logs to GC log analysis tools such as GCeasy.io or using programmatic REST API. REST API is useful when you want to automate the report generation process. It can be used in CI/CD pipeline as well. Thread count is an interesting metric to monitor. If thread count goes beyond a limit it can cause CPU, memory problems & application crashes. Too many threads can cause ‘java.lang.OutOfMemoryError: unable to create new native thread’. Thus, if thread count keeps peeking up in the application it can be an indication of some sort of brewing problem in the application. Application threads can be in different 6 different states: NEW, RUNNABLE, WAITING, TIMED_WAITING, BLOCKED, TERMINATED. Too many threads in RUNNABLE state can cause CPU spike. Too many threads in BLOCKED state can make application unresponsive. If number of threads in a particular thread state exceeds your application’s typical threshold then it’s an early indicator of performance hazard building up in your application. A thread group is a collection of threads that perform similar tasks. There could be a servlet container thread group that processes all the incoming HTTP requests. There could be a JMS thread group, which handles all the JMS sending, receiving activity. There could be some other sensitive thread groups in the application as well. You monitor those thread groups size. You don’t want their size neither to drop below a threshold nor go beyond a threshold. Less number of threads in a thread group can stall the activities. More number of threads can lead to memory, CPU problems. (a). Say your SOR or external service is slowing down then a significant number of threads will start to wait for its response. In such circumstance, those threads will exhibit same stack trace. (b). Say a thread acquired a lock & it never released then, then several other threads which are in the same execution path will get into the blocked state, exhibiting same stack trace. ©. If a loop (for loop, while loop, do..while loop) condition doesn’t terminate then several threads which execute that loop will exhibit the same stack trace. When any of the above scenarios occurs application’s performance, and availability will be jeopardized. You might want to focus on thread execution patterns. 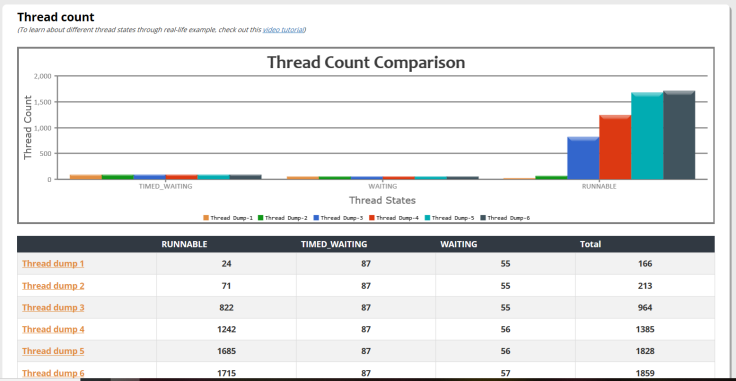 How to generate thread related micrometrics? There are several options to capture thread dump from your application. You may choose the option that is convenient to you. It’s advisable to capture thread dumps in gap of 5–10 seconds to do analysis. Once thread dumps are generated you can either manually analyze them through thread dump analysis tools such as fastThread.io or using programmatic REST API. REST API is useful when you want to automate the report generation process. It can be used in CI/CD pipeline as well. Modern application connects with multiple external applications (Needless to say in microservices world, where there is too many external connectivity). 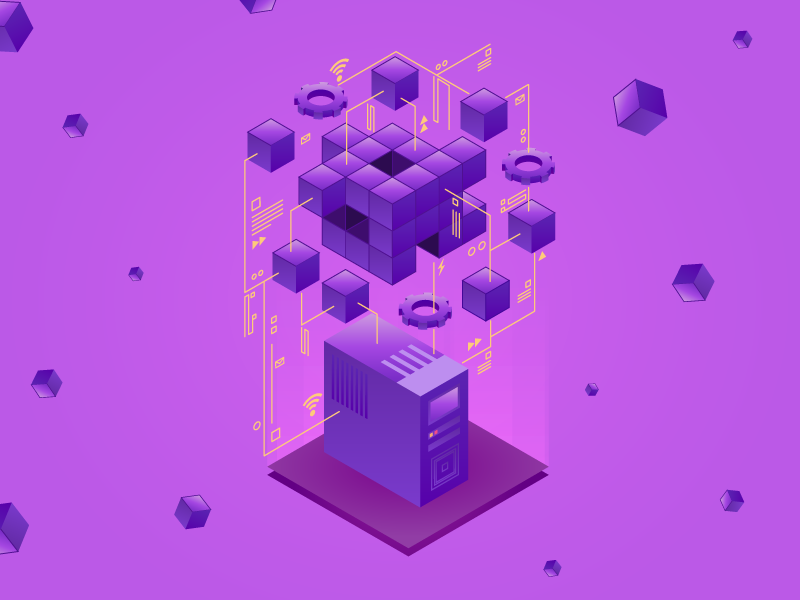 Connections are established in various protocols: HTTP, HTTPS, SOAP, REST, JDBC, JMS, Kafka… In this kind of ecosystem your application’s responsiveness and availability is dependent on external applications availability and responsiveness as well. Thus, you need to monitor number of connections established from your application to external applications. If you see connection count to be growing more than normal traffic volume pattern, then it can be a concern. Whenever there is slow down in the external application, there is a possibility for your application to open more and more connections to the external application to handle the incoming transactions. Above command will show number of established connections to the host ‘162.187.223.11’. There are 11 different TCP/IP states: LISTEN, SYN-SENT, SYN-RECEIVED, ESTABLISHED, FIN-WAIT-1, FIN-WAIT-2, CLOSE-WAIT, CLOSING, LAST-ACK, TIME-WAIT, CLOSED. You need to monitor number of connections in each state by each external system your application connects. If you notice particular state’s count start to grow i.e. CLOSE-WAIT or LAST-ACK … then it could be indication that some kind of network connectivity issue is brewing the application. Above command shows number of connections in ‘TIME_WAIT’ state. Similarly, you can grep for other states as well. If you notice File descriptors counts to be growing in your application, it can be lead indicator that application isn’t closing resources properly. Unclosed file descriptors after it’s utilization will lead to performance/availability problems. Below command will report all the open file descriptors for the process Id ‘5666’. Storage throughput is basically common value that shows how much a storage can deliver. This number is usually expressed in Megabytes / Second (MB/s), example 140 MB/s. Below formulae derives throughput. Each IO request will take some time to complete, this is called the average latency. 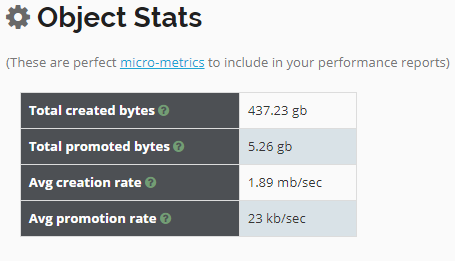 This latency is measured in milliseconds and should be as low as possible. There are several factors that would affect this time. Many of them are physical limits due to the mechanical constructs of the traditional hard disk. This micrometrics can be monitored in production environment for forecast brewing production problems. 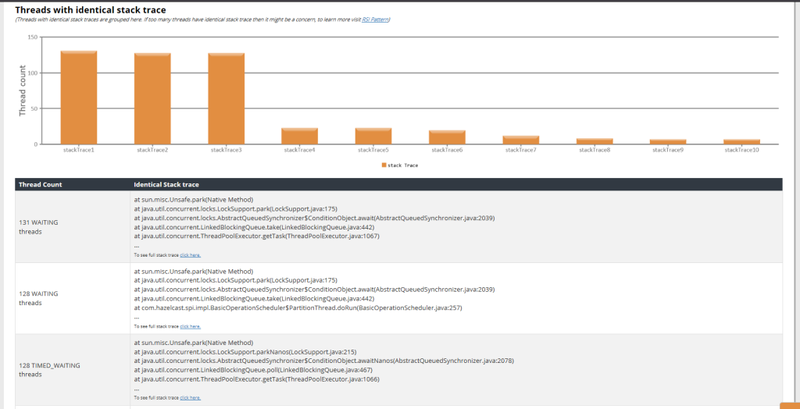 On top of it, they can be used in CI/CD pipeline to monitor code quality. We hope you find this micrometrics to be useful. If you think there are more powerful micrometrics that can forecast application performance, you email us team@tier1app.com. We will be glad to update this article with the metrics you had pointed out.